A best selling item, this Stylish Shabby Chic French Style Bed is made of sturdy wood and has beautiful mouldings on both the footboard and headboard. This French Roccoco style Kingsize bed has a professional silvered finish, slightly distressed providing a much desired look and character. 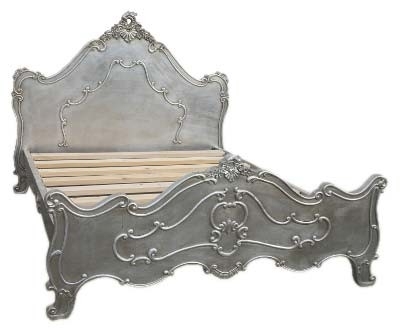 Ornate raised detailing on the headboard, footboard and side panels. Solid slats on the base of the bed and sturdy legs for extra support. Flat packed and delivered in four boxes. Matching dressing tables, bedsides, armoires, tallboys, chest of drawers and other bedroom furniture in the Provence Argent Boudoir Range available to complete a full bedroom set.